Signs of Life showed selected works from Garlinda’s trips to Iceland, Patagonia and Atacama at Unit 1 Gallery | Workshop, 1 Bard Road, London, W10 6TP in the first week of November 2017. Click here to view the photographs from the opening night. The price list with thumbnail images along with information about the show, Garlinda’s trip and biography can be downloaded from this page. If you would like to see the work, which has now been re-hung at Garlinda’s flat in Notting Hill, please contact Clare to find out dates for the private viewings. The show was sponsored by Original Travel and a percentage of the proceeds from the show were donated the charity Familia. If you would like to make a donation to the charity Familia, click through to their Just Giving page here. 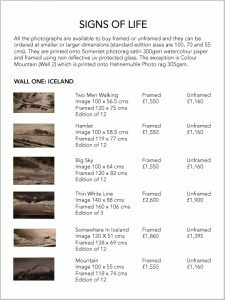 We would like to thank Original Travel, who organised Garlinda’s trip to Iceland, for sponsoring the Signs of Life Exhibition. Familia is a tiny community in West Bengal, India, that provides a loving family life for orphaned or abandoned children and a secure haven for aged women and men who are without a family of their own. The charity meets approximately 30% of their costs each year through farming; they have 20 acres of land, 30 milking buffaloes, chickens and two fish ponds. They also grow as many vegetables, rice and fruit as they can. However the price they can achieve for their produce is very low so there is inevitably a gap between income and expenditure each year.